EASY TO USE- It will be easy to use it for chicken soup packed with this raw materials into natural paper pulp. 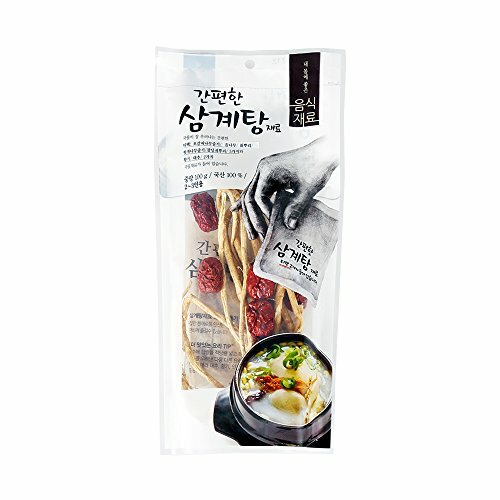 HIGH QUALITY - Contains convenient tea bag and soup ingredients from which soup stock is made well. TRADITIONAL KOREAN FOOD - Ginseng chicken soup is a traditional Korean food and you can eat a whole chicken boiled together with ginseng, milk vetch roots, jujube, ginger and garlic. HIGHLY PROTEIN MEALS - Major customer groups are workers, dual-earner households, single-person households, pregnant women and seniors who need highly notorious protein meals. QUICK & CONVENINET RECIPE - Despite the busy schedule, you can quickly and easily use our products. Manufacturer: Haesong KNS Co., Ltd. Publisher: Haesong KNS Co., Ltd. Studio: Haesong KNS Co., Ltd. If you have any questions about this product by HaesongKNS, contact us by completing and submitting the form below. If you are looking for a specif part number, please include it with your message.